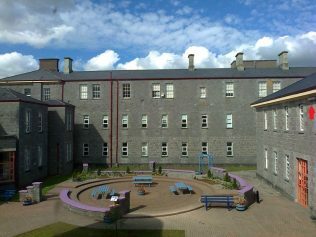 Green Campus Sanctuary Garden, GMIT Mayo Campus. The red arrow indicates the location of the nest boxes. Traditional nest site, with entrance indicated. Swift in flight above the building. Swift resting briefly on top of a nest box. There are many aspect of swift behaviour we don't fully understand. This is one of them! GMIT Mayo Campus in Castlebar has established a swift conservation project, using nest boxes as a key tool in conserving these important birds. Swifts are amber-listed as being of conservation concern in Ireland and Europe. This is a Green Campus project, part of our biodiversity theme. GMIT Mayo Campus is the first Institute of Technology campus in Ireland to be awarded a Green Flag by An Taisce (this was for the themes of energy, water and litter and waste) and the first campus in the country to be awarded the Green Flag for biodiversity. People often mix swifts up with swallows and house martins. Swifts are dark in colour with a pale throat. They have long, narrow, scythe-like wings and a tail that is slightly forked. 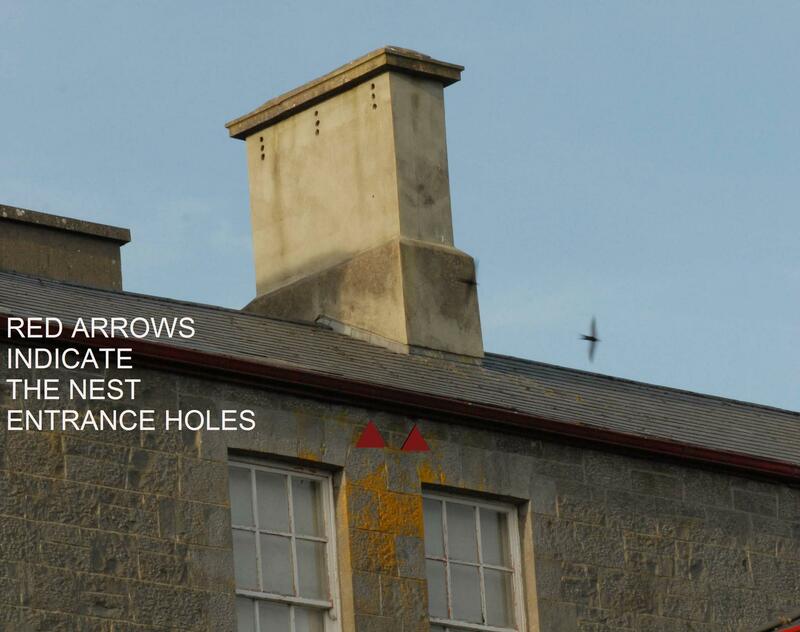 Here is some guidance on how to tell swallows, swifts and house martins apart. The BBC have also provided some useful tips on this here. If you see birds building a nest outside, then it is unlikely to be a swift. They live in holes in buildings or purpose-built nest boxes. 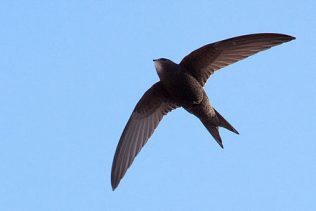 The scientific name for the swift is Apus apus, meaning ‘no foot, no foot’. The swifts do in fact have feet but they are very small and used only for clamouring into nest holes. They rarely land on the ground as they find it difficult to take off again. However, swifts fly very quickly, hence their name and can fly up to 800 km a day. Although many people confuse swifts with swallows and house martins, they are not related to these birds. They are more closely related to the hummingbird. The swifts’ wings beat up to eight times per second when in flight. In summer time, so-called ‘screaming parties’ of swifts are a common sight near areas where they nest. One of the major concerns in swift conservation is habitat loss. 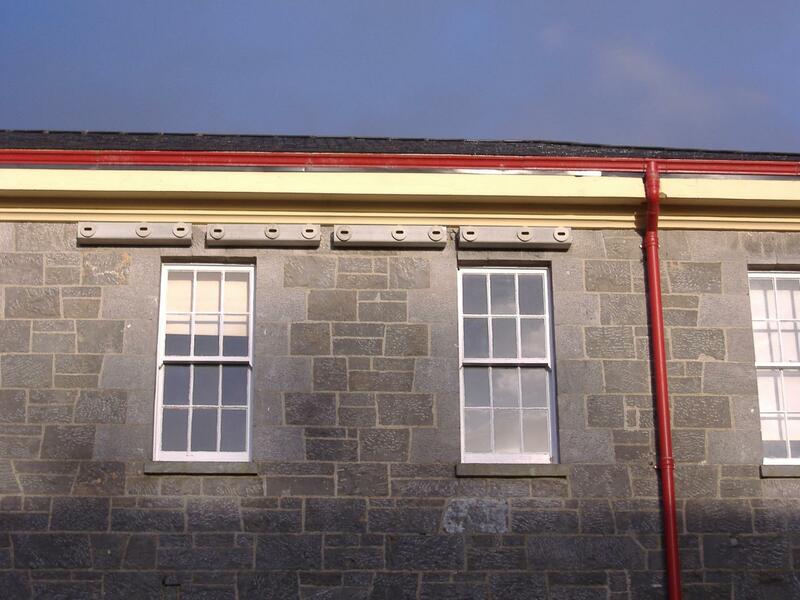 Swifts breed in buildings, either at the top of walls behind the facia board or in holes in walls. 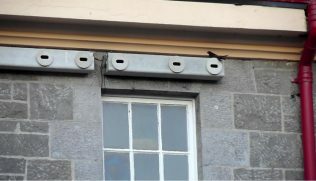 Renovation of buildings can cause these openings to become sealed, resulting in the loss of the swifts’ nesting habitat. When installing nest boxes at GMIT Mayo Campus, we had to make sure we weren’t blocking up an existing swift nest. The boxes were installed in the courtyard, near the Green Campus Sanctuary Garden. An existing traditional nest site was located on a different side of the courtyard. We made sure not to interfere with this when work was carried out. 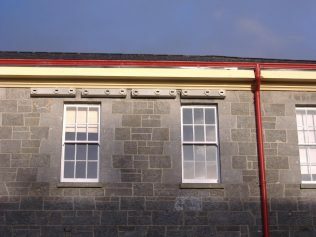 In this case, the swifts live behind the facia board. 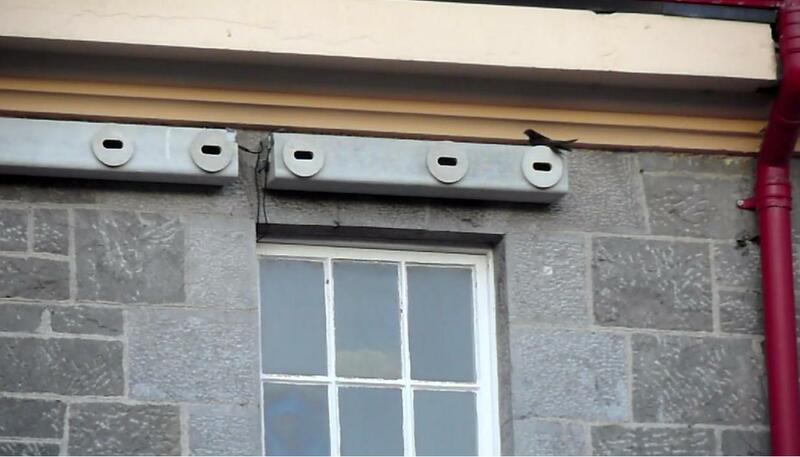 Swifts come to Ireland from early May to late August each summer and nest mainly in old buildings. Once they leave Ireland, they return to Central and Southern Africa, a round trip of over 2,200 km. They are colonial breeders, returning year after year to the same site, if their nest site survives. Swifts chose to be near other swifts, so we play swifts calls on a CD in order to attract swifts that are looking for somewhere to breed for the first time to the nest boxes. Swifts feed mainly on insects and eat, drink, preen and sleep on the wing. They eat insects including flies, mosquitoes, midges and greenflies. They also consume airborne spiders. 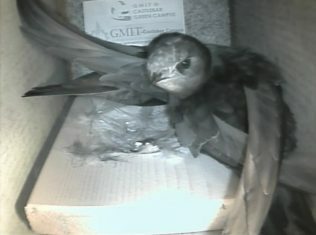 The boxes were put in place in April as the swifts usually arrive in May. The boxes are Schwegler Triple Cavity nest boxes, which are made of woodcrete and have a 25 year guarantee. The entrance hole is ideally sized to be suitable for swifts but not for other birds. 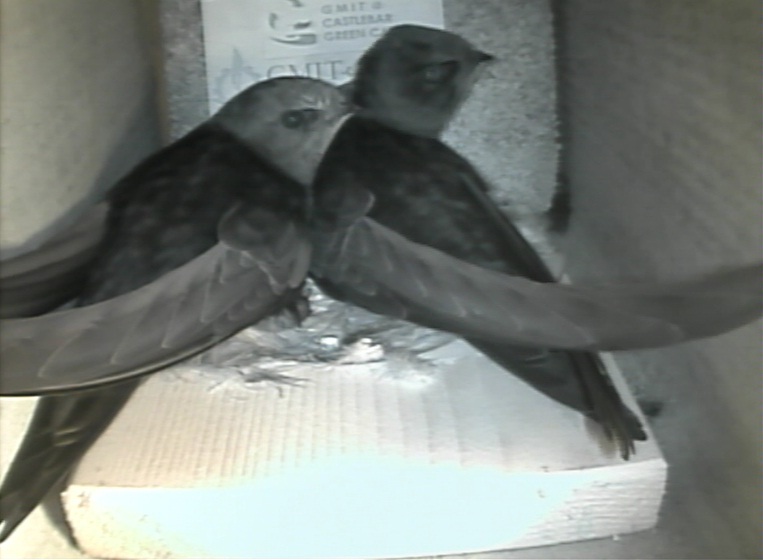 Nest moulds were placed inside the boxes with some feathers added to them to provide an appealing nest for swifts. The birds collect additional material and bring this into the nest. Cameras were installed in two of the boxes initially but now all the boxes contain cameras. We plan to live stream from the four most active boxes on the internet this summer. We acknowledge, with thanks, funding received from Local Agenda 21 for this project.